NEW ORLEANS – The top team might have remained the same for the second week to open the year but two new programs joined the top-5 in the latest edition of the NCAA Division I Women’s Indoor Track & Field National Rating Index released by the U.S. Track & Field and Cross Country Coaches Association (USTFCCCA) on Tuesday. Arkansas remained No. 1 for the second week in a row. The program recorded 148.93 points and has competed once as a unit so far this year with the Arkansas Invitational back on January 11. It is the first time the program has opened the first two weeks of a season at No. 1 since 2016. Improving one spot to No. 2 was Texas A&M after receiving 117.47 points. The Aggies have competed in three meets so far during indoors including picking up team wins in the Ted Nelson Invitational and the Texas A&M Triangular. Top performers include Syaira Richardson, who is sixth nationally in the 400 (53.18) and the program’s 4×400 relay, which is currently fifth overall (3:35.25). Two of the nation’s best 800 runners in Jazmine Fray and Sammy Watson have not run in the event yet this season. Jumping up nine spots to No. 3 was Texas with 102.60 points. The Longhorns are fresh off competing at the Clemson Invitational this past weekend and have experienced a well-rounded effort by each event group. Freshman Kennedy Flannel leads the nation in the 200 (22.88) and is tied for seventh in the 60 (7.26), Gabby Crank is third in the 800 (2:04.50), while Shay Petty sits ninth in the pole vault (4.29m 14-0.75). The 4×400 relay team is currently ranked third nationally. Texas was the only new program to join the top-10 this week and recorded its best mark since Week 1 of the 2016 season. Moving up four spots was No. 4 Georgia with 101.10 points. Last year’s defending champions are also fresh off competition at the Clemson Invitational and have also competed in three events this year. The unit has been led by Lynna Irby, who is second nationally in the 200 (23.27), Aliyah Whisby is tied for fifth in the high jump (1.80m, 5-10.75), Titiana Marsh is eighth in the triple jump (13.00m, 42-8) and 13th in long jump (6.19m, 20-3.75) and Anna Marian Block is 13th in the 800 (2:08.81). The 4×400 relay is also tops in the country by almost a full second (3:32.50) and standout jumper Madeline Fagan has yet to compete so far during indoors. Dropping three spots but still remaining in the top-five was No. 5 Florida State with 93.12 points after being idle. The Seminoles have gotten strong performances so far out of Jayla Kirkland who is third in the country in the 200 (23.33), Cortney Jones is third in the 60 hurdles (8.12) and Rougui Sow is third in the long jump (6.42m, 21-0.75). Other top contributors will be Ka’Tia Seymour (currently seventh in the nation in the 200) and high jumper Eleonora Omoregie, who has yet to compete. Rounding out the rest of the top-10 was No 6 Florida (88.54 points), No. 7 Southern California (88.07), No. 8 Kentucky (82.21), No. 9 LSU (81.83) and No. 10 Oregon (80.85). The largest leap in the ratings of top-25 teams belonged to No. 16 Texas Tech with a 10-spot improvement. It was the best rank for the program since the preseason poll to kick off the 2009 season. The biggest gains in the nation overall belonged to No. 44 North Carolina (54-spot improvement), No. 36 Arizona State (up 53), No. 84 Mississippi (up 47), No. 56 McNeese State (up 40), No. 57 Central Michigan (up 37), No. 51 Colorado State (up 36), No. 53 Houston (up 32), No. 50 Villanova and No. 92 Incarnate Word (both up 29) and No. 26 Kennesaw State (up 21). 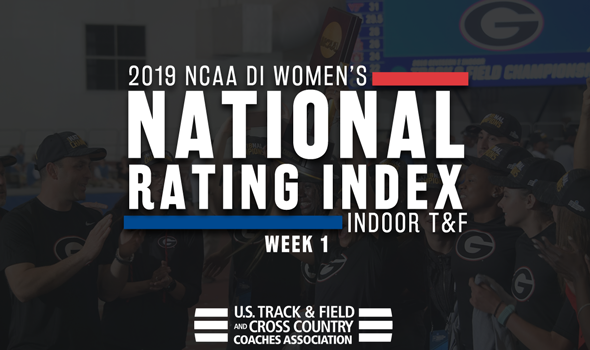 The next National Track & Field Rating Index will be released on Monday, January 28.